When it comes to achievements and success, the journey is far from an easy task to complete. It's all or nothing in this game called life, there is no in between. Pennsylvanian emcee Izzy Strange once again combines lyrical forces with Chicago's Mick Jenkins to enforce a term made notorious by the infamous Mobb Deep on their breakout track, "Shook Ones Pt. 2". 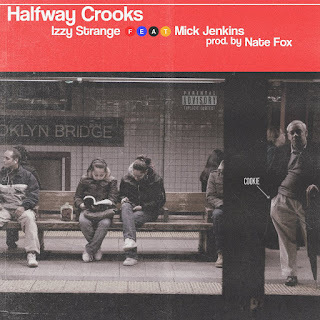 On this eerie, nineties themed instrumental crafted by Grammy Award winning producer Nate Fox, Izzy and Mick inform listeners that there's still no such thing as "Halfway Crooks". Leaving underachievers shook, the hook aggressively encourages people to quit crying about the cards they are dealt. Instead of whining about the odds, Strange and Jenkins urge us to continue giving it all we have until our last breath has been taken. The song concludes with DJ Halo cutting up key lines from both artists' verses, a perfect touch to end things off on. "Halfway Crooks" is the second release from Izzy Strange's forthcoming mixtape, "Izzy Duz It", which is set to drop this Halloween, October 31st. The first single was the eclectic "Just Me", a soulful release that featured underground legend Blu and rising Pennsylvania single, Sara Fox. The mixtape title was inspired by the late Eazy E's debut album, "Eazy-Duz-It", and will also boast features from Tedy Andreas, Nacho Picasso, and more. "Izzy Duz It" will also be served as a precursor to his next full length album, "The Die Is Cast", set to release sometime in 2019. Statement from Izzy Strange pertaining to "Halfway Crooks" In the path of success, you have to throw yourself completely into your goals. There's no such thing as half assing your way to achievements. The people who put in the work, the 24/7 grind, are gonna be the ones that win. They are the people working while others are sleeping or are distracted by other aspects of life. If you really want something, you gotta go out and put the work in. There's no whining in baseball and there's no such thing as "Halfway Crooks". The name of the song is a reference to the Mobb Deep track, "Shook Ones Pt. 2". I first received the beat from Nate Fox last November. It made me think off something old school, like early Wu-Tang. I was flipping through my notepad, just messing around with rhymes. I was going through alot at the time, so a grittiness came out when i recorded. I knew I wanted to get a feature for the song but wasn't sure of who right away. Then, Mick Jenkins dropped his mixtape, "Or More ; The Anxious". I heard the song "Happy Gilmore"and thought he'd be a perfect fit for this. I contacted him and before you knew it, we had "Halfway Crooks", the bipolar opposite of last year's single, "No One But Me". With my recent week 3 win in A3C's "This Is My Year" contest and performing on The Discovery Stage Friday, October 5th, I felt this was the ideal time to present the new single to the world.